THE Malaysian challenge for an Olympic medal from badminton has been whittled down to just one contender following the exits of Wong Mew Choo and the men’s pair of Koo Kien Keat-Tan Boon Heong at the Beijing University of Technology Gymnasium last night. And Lee Chong Wei will shoulder the responsibility of keeping the Malaysian hopes alive when he takes on Indonesian Sony Dwi Kuncoro today for a place in the men’s singles semi-finals. Kien Keat-Boon Heong were beaten 16-21, 18-21 by Indonesian world champions Markis Kido-Hendra Setiawan in the quarter-finals. Malaysia’s Koo Kien Keat (right) and Tan Boon Heong in action during their loss to Indonesia’s Markis Kido and Hendra Setiawan in the quarter-finals on Wednesday. The Malaysian duo had showed solid form in their opening match win over Japan’s Shuichi Sakamoto-Shintaro Ikeda on Tuesday. But they lacked the aggression needed to beat the top seeded Markis-Hendra. The Indonesians were solid in defence and led all the way to take the first game 21-16. Kien Keat-Boon Heong offered a bit of resistance when they led briefly at 14-11 in the second game but had no answers when the Indonesians turned on the style. 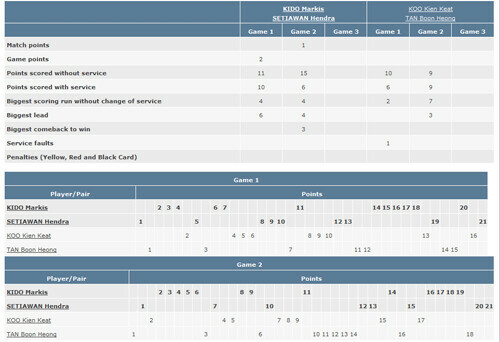 Markis-Hendra regained the lead at 18-17 and never looked back to win the match. 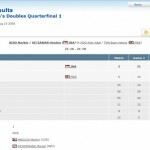 It was the first time in six meetings that Kien Keat-Boon Heong lost to the Indonesian pair. Kien Keat conceded that the Indonesians were outstanding in defence and it was hard to break their rhythm. “They have become familiar with how we play since we beat them in the 2006 Doha Asian Games. They know our weak points. We could not get our game going even we tried to come back,” he said. Hendra said that they knew the Malaysian pair would be difficult to beat and it was a matter of them going in for the kill first. “We have to start attacking. We were also under no pressure because we have not beaten them before. 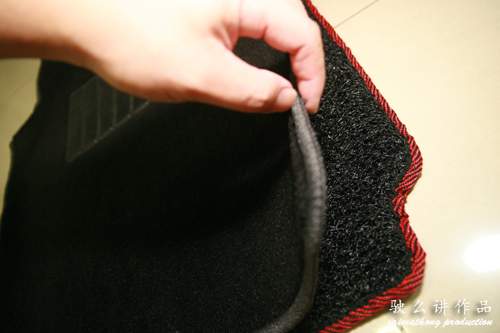 That helped us a lot. Now, we have a chance to win the gold and we will go all out to get it,” he said. Markis-Hendra, who have the chance to follow in the footsteps of fellow Indonesians Rexy Mainaky-Ricky Subagja (Atlanta 1996) and Candra Wijaya-Tony Gunawan (Sydney 2000), will play against Danish veterans Jonas Rasmussen-Lars Paaske for a place in the final. The Danes, who sent the top Korean pair of Lee Yong-dae-Jung Jae-sung packing in the first round, came from behind to beat Poland’s Michal Logosz-Robert Mateusiak 17-21, 21-11, 21-15 in the quarter-finals. China’s golden hope Fu Haifeng-Cai Yun advanced to the semi-finals with an easy 21-9, 21-10 win over Americans Howard Bach-Bob Malaythong. The second seeded Chinese pair will be up against Jae-jin-Ji-man, who beat Tadashi Ohtsuka-Keita Masuda of Japan 21-12, 18-21, 21-9. 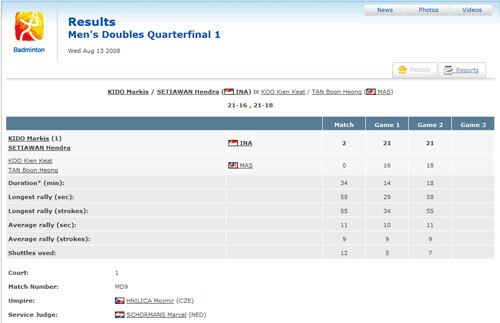 Koo Kien Kiat / Tan Boon Heong (Malaysia) Lost to Markis Kido / Hendra Setiawan (Indonesia) two straight games in Badminton Men’s Doubles Quarterfinal 1 , Beijing Olympic. Indonesia won! 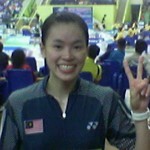 Malaysian performance is this 2008 Beijing Olympic Badminton is not as good as what the rest of the world think. I think Koo Kien Kiat and Tan Boon Heong today played badly. Their understanding between each other does not exist and they keep on fighting for the shuttle and let the opponent have the chance to kill them. Running and positioning is very important and I think the Malaysian have to work harder on that. KKK and TBH did not attack much in these 2 games but the opponent keep on attacking because the Malaysian keep giving chance to them. KKK and TBH made a lot of mistake and mistake during serving too. Very sad and disappointed over the performance and result. 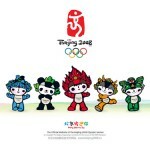 It’s sad that now we only left Lee Chong Wei in the run of getting a medal in Beijing Olympic. Hopefully Lee Chong Wei able to make it tomorrow 14 August, 11.30am, Channel 821 on Astro Super Sport, Stadium Astro.